77th Earth Science for Energy and Environment conference. This study aims to develop the application of photogrammetry for geological mapping in an open pit mine (Lindsays Pit located in Coolgardie, Western Australia). Several photographic surveys of the same pit were captured under different light conditions using different focal length lenses. Photogrammetry was applied to the photographs to match pixels, construct point clouds using a powerful bundle adjustment algorithm, then converts these point cloud into wireframe and textured three dimensional models. The three dimensional models are georeferenced using a method where UTM coordinates were accurately determined for ground control points, spread across the entire pit, using survey grade GPS. 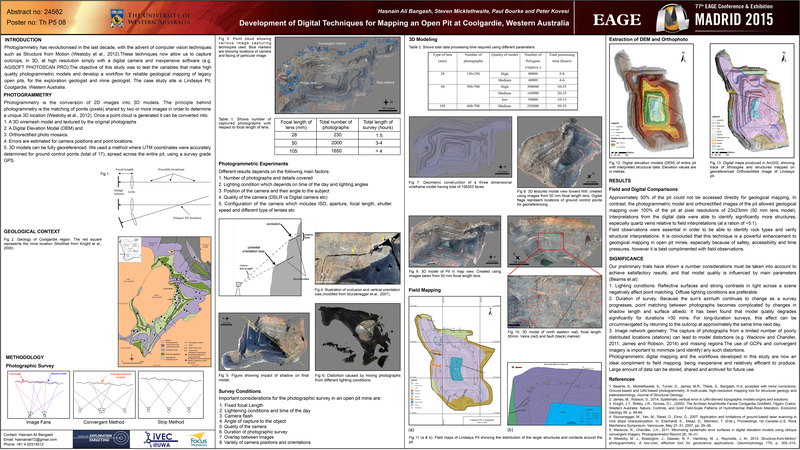 Digital elevation models and orthorectified images were generated from the photogrammetric models to digitally map the pit. Field work was also carried out to complete pit mapping by conventional methods. The field maps were then compared with the interpretations derived from digital mapping. The digital interpretations were able to identify significantly more structures, especially quartz veins (about 500 as compared with 100 through field mapping), and they were able to obtain data from inaccessible exposures. However, field mapping did detect some important structures not necessarily evident in the digital dataset and field observations were essential in order to be able to identify rock types and verify structural interpretations. It is concluded that this technique is a powerful enhancement to geological mapping in open pit mines, especially because of safety, accessibility and time pressures, however it is best complimented with field observations. Photogrammetry also offers an unprecedented ability to archive and share fundamental geological data.